This year we took advantage of P’s massive collection of frequent flyer miles to take a trip south of the border, way south, to Argentina and the magical land of Patagonia. We both speak Spanish fluently, so this isn’t as daring an escape as it might seem. P had done some research, and found that while the trails to Torres del Paine are quite congested, and the campsites jam-packed, the small town of El Chalten has great hiking trails, and seemed to be less crowded. We would see. The peaks of Fitzroy and Cerro Torre compete in every way with Torres del Paine, so we thought it was worth a shot. On the way to Patagonia, we stopped for a few days in Buenos Aires, one of the world’s more interesting cities. It’s larger than you can imagine, and even with friends and family there, we still find it too large to really understand. But we enjoy it. Our first day we spent walking from our cute hotel near the wonderful Ateneo Bookstore (inside a renovated theater, complete with café inside) all the way down Avenida Santa Fe to the Plaza San Martin, honoring that revolutionary hero, then across to the Casa Rosada (presidential palace) and back to the hotel past the largest boulevard in the world. 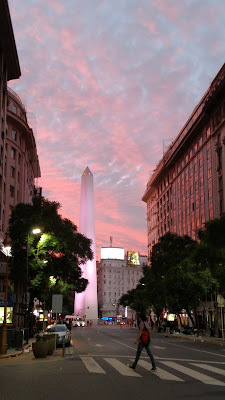 And we caught the sunset just right behind the classic obelisk of Buenos Aires. The next day was devoted to art: the Modern Art Museum (MAMBA) in San Telmo and the Fortabat collection in the trendy new Puerto Madero barrio. Both were well worth a visit. In between, we stopped in at the Museum of the City of Buenos Aires, which is a wonderfully fun and irreverent look at life in the city, but it was under construction and had very limited exhibits. The rest of the day was dedicated to visits with friends and family. The third day we spent exploring the area near our hotel—the Calle Arenal and the Recoleta district, which is every bit as lovely as parts of Paris. A few art galleries, a few plazas, a lunch in a local hangout, and we were delighted. Dinner with friends that night, and we were off to the domestic airport (BA has two, and it is not a good idea to confuse them!) the next morning for our flight to El Calafate on Aerolineas Argentinas. As always when we travel in Latin America, we gave ourselves plenty of time at the airport, and the flight was a piece of cake. Although it was cloudy for much of the flight down, P had cleverly selected windows on the west side of the plane for the trip down. And as we got into Patagonia, the skies cleared and we had stunning views of the desert steppes leading off to the snow-capped Andes extending for miles, hundreds of miles, out the window. When we landed in El Calafate we were facing a three-hour drive north to El Chalten. (Torres del Paine is a bit longer, and to the south). At the airport we took the first available shuttle to El Chalten, which was with Las Lengas minivans. We’d read some negative reviews (and some positive ones) but the next full-sized bus wouldn’t leave for three hours. As it turned out, it was the smartest thing we did all trip. It was a sparkling day in El Chalten, and we immediately took advantage of that to climb up the few miles to Mirador de los Condores and Mirador de las Aguilas—two high points east of town served by a trail that leaves the office of the national park. And while we didn’t see either condors or eagles, we did meet some fun groups of other hikers, and caught views of Mt. Fitzroy, Cerro Torre, Lago Viedma, and the local rivers (de las Vueltas and Fitzroy). A great way to find our way around town—followed by a quick dinner at Ahonikenk, an inexpensive local restaurant Raul had suggested. It was fun, cheap, and tasty. Raul warned us that the skies are not always so clear, and so we took his advice the next morning, and headed up the trail to Laguna Cerro Torre. First we had to find a sandwich shop that was open on Sunday morning…and the little bakery next to Ahonikenk fit the bill. But that was a bit of a hike from our hostel, and then the trailhead was back where we started, so we didn’t really hit the trail until about 9 a.m. And there were lots of other people on the trail. Before we had hiked the first of ten kilometers, we met a ranger who encouraged us to visit the national park offices and exhibits in town. We assured him we would—and that we were sorry they closed at 5 p.m., or we would have dropped in the night before. The first three kilometers out of town on this trail are a steady climb up over a ridge on across an old moraine. We seemed to be hiking at the same pace as a guided group, and unfortunately the guide spoke in a very piercing voice so that all of his group could hear him. Grrr. We eventually put enough space between us and him that the voice slowly faded into the distance. After that first climb the trail is very easy, along the Fitzroy river valley, until you get quite close to the lake, when you have to climb the last moraine to see the glory. And my, it was glorious! A part of the trail led off to the right, above the lake, along the very crest of the last moraine to a point named for the Italian climber Maestri. We took it partway along, and then decided to call a halt. We sat in awe and ate our sandwiches, occasionally hearing the roar of an ice fall on one of the glaciers in front of us. A lovely young woman from Slovakia saw us, took our picture, and sent it to us later. Thank you, Stefi! After hiking about 13 miles, we ended up back at our hostel (Nunataks—clean, inexpensive, and very functional—and very close to the trailheads into the park). We napped for a bit and then went to eat at the Rancho Grande next door, with empanadas, a salad, and a big steak. Steaks are a sure bet in Argentina, and this was no different. We found food and wine in El Chalten reasonable, but with limited choices. Wines in the restaurants were uniformly good and cheap—particularly if you chose the Malbec. Day three in El Chalten was going to be a rest day. We knew that the following day would be a tough one, climbing up to Lago de los Tres, and so we decided to take it easy. We went back to the ranger station, pestered them with all sorts of questions about the flora and fauna that we’d seen, and then took a trail up towards the Lomo del Pliegue Tumbado—the hill of the fallen wrinkle. This was a lovely hike up a small canyon, then up the side of a ridge with frequent views around to the mountains of El Chalten. We took snacks, and eventually broke off trail to eat them in solitude overlooking Lake Viedma. And as we sat there, M noticed a condor sailing overhead, to our complete delight. We were back in town in time for lunch, and then decided that we had time to run up the 6 k to the little waterfall Chorillo del Salto. The first part of this hike is confusing. The road signs indicate to take the road, but we learned later that the trail leaves from just inside the park gate, right where the trail to Laguna de los Tres starts.) Instead, we walked along the gravel road for a mile, until the trail crossed it and we could follow the trail through forests and along the river. We saw an amazing Giant Patagonian Woodpecker who just about landed on our head, but by the time P could get out his camera, the bird had cleverly hidden itself on the other side of some branches. The size of a crow, this bird has a completely red head. It is unmistakable! The waterfall is lovely, and as always on this trip, there were plenty of other people around. But we also enjoyed the signage that indicated this was a contemplative area—no rough-housing! In true Argentine fashion, one older couple calmly sat down and drank their mate tea while they gazed at the water. On the hike back we spotted more birds, and by the time all was said and done, we’d hiked another 12 miles or so on our “off” day. Dinner that night was at the Cerveceria (the brewery) where we drank local brews and enjoyed a typical Locro stew of hominy, meat, and potatoes. Yummy. We had made arrangements for Las Lengas to pick us up early the next morning for a drive up to the Hosteleria del Pilar. This hostel also marks the beginning of an alternate route to Laguna de los Tres, and we were looking forward to some stunning scenery, as well as fewer people on this part of the trail. Yes and no. Of course, everyone who hikes this trail catches the same group of shuttles, on the same schedule, so we leapfrogged with a couple of large guided groups in the early stages of the hike. But the scenery was spectacular, include the vista of Piedras Blancas, where you could see an enormous hanging glacier emptying out into the river. For ten kilometers we hiked along, enjoying the view and working out way slowly up the valley and through the woods to the climb up to Laguna de los Tres. The last stop was the Poincenot campground (named after a French climber who died on one of the early attempts at Fitzroy) and it convinced us that day-hiking was the way to go. Densely packed with young campers from around the world, it had only one toilet for about 200 people, and it was…unspeakable. Yeah, we know. But we’ve traveled a lot of places. This was not a good one. And from there the trail goes straight up. Almost literally. It climbs 700 meters in just about one kilometer. That equals a rate of about 3,700 feet per mile, and I don’t know of another trail anywhere that is that steep. And while it starts out steep, it then gets a lot steeper. And then in the second half of the trail, steeper still. At the top of the ridge there is a brief respite of 50 years, and then the last 150 years seems to go straight up. The only saving grace is that the elevation is still manageable—about 4,500 feet at the top—so you are not sucking for air. You just wish you were twice as strong. The maps all say that it takes an hour to hike this last kilometer, and we found it took slightly more than that. Amazing. What an amazing place this is, with huge glaciers hanging over the lake, and another lake just below behind a low ridge. The wind here was howling (in fact, it howled the whole time we were climbing, and all the way back to El Chalten) and so everyone was bundling up to avoid hypothermia. But everyone was also grinning. This hike is the Half Dome of the park, and there were tons of people. But the atmosphere and camaraderie were quite nice. We ate lunch, enjoyed the view, sat until we were just too cold, and then started back down. From Poincenot Camp, we took the normal trail back to El Chalten, which led us to a lovely view of Lake Capri. The campground here looked to be in better shape, and maybe less crowded. The toilet, at least, was newly built and quite nice. And from here we were chased by the wind back to town, with a nice overlook of the Rio de las Vueltas, to our hostel. Another 12+ mile day, when all was said and done. Did we mention the wind? It blew P’s hat off his head twice (never before had that happened!) and once we were in town, people were bent over as they struggled to make headway against it. Dinner was at a newer restaurant, Pangea. More expensive, but really nice, and used more than the usual three or four ingredients of most of the dishes in El Chalten. We loved it. On our last day in El Chalten we wanted to revisit the ranger station and ask more questions. And we spent some time in shops and wandering about the backstreets of town. When we entered the tourist information office, we commented on the wind to the young woman there. She looked a bit surprised and informed us that this was not a windy day. Not in El Chalten! It’s a funny town. It’s full of young backpackers (some with obviously limited funds…and maybe limited soap/razors as well) and other more hard-core older hikers from around the world. Lots of people trying to find cheap eats and cheaper places to stay, as well as a few much more expensive hotels. We were warned that there was only one ATM, and it frequently ran out of cash. But there are two, and we never had a problem getting cash—important, because almost everyone in El Chalten refuses credit cards. And we were warned that there was only one grocery story, with limited merchandise. We counted at least eight in town, but the selection was almost always the same, very limited, and for three of the days we were there, the only fruit you could buy was oranges. Seriously. People in town were very friendly and helpful, but this is a new town (created in 1985) and nobody we met was born here. Except our last adventure in El Chalten. We’d been told that we could get a personal tour of the old Estancia Cerro Andres Madsen if we wanted one. At the end of the only bridge over the Rio de las Vueltas, at three in the afternoon, the great-grandson of Madsen himself would meet people and give them a tour of his family’s original pioneer homestead. And we loved it. Roy was the perfect host. He gave us both a thorough and personal history of the region, told us many of the local tales, showed us his family home (built room by room, as the family grew), toured us through the family cemetery and told the story of each member there, and then invited us into his home to page through books full of photos and have a nice cup of tea and cookies with him. It was totally cool. Dinner that night was at Fuegia, another more upscale restaurant that we enjoyed very much, and included a serenade by a couple of itinerant musicians who were really pretty good. And P’s a sceptic. He was convinced. Las Lengas picked us up the next morning to take us back to El Calafate, where we stayed at the La Cantera hotel. My goodness, this was a step up! First class all the way, with a nice location just above downtown and view over Lago Argentino. We spent the afternoon exploring El Calafate, and discovered a very different vibe here. Nobody was carrying a backpack. Everybody was clean and shaved. Restaurants had hjgh mark-ups on wine…the whole thing reminded us more of Carmel or Jackson Hole, while El Chalten was a bit more like Yosemite’s Camp 4. But M had heard there were flamingoes along the shore, and so we set out to find them. Easy as pie, they were right where they were supposed to be! We watched for a while, then set out for the little museum in town, which was a wonderful combination of paleontology, anthropology, and history, all boiled in to one. Really nice, and every visitor is invited to enjoy a mate tea afterwards, on the house! We loved this one. And then we went back and looked at the birds again…and ate at Mako, a wood-burning brick oven restaurant downtown. Yummy. The next day, our hotel managed to find us a quick tour of the Perito Moreno Glacier. Simply amazing. We had a great guide in the minivan, who encouraged us to get out and hike all the trails at the glacier. We did. Simply amazing. A vast sheet of ice that is obviously in motion and stress, creaking and groaning, cracking off huge sections into the lake. We could have watched for hours. But we had a flight to catch. The minivan got us back to the hotel at 4:20 and our taxi was there at 4:30 to take us to the airport and catch the flight back to Buenos Aires. It all went off without a hitch. Two more days in Buenos Aires, including visits to the flea market in Palermo, and the Bellas Artes Museum. We caught a car out to the airport the next afternoon, and were on our way home again.